Jakarta, 9 October 2017 – As part of our commitment towards a collaborative effort to find what works for poverty reduction, Kopernik proudly hosted two sessions at the third annual Sankalp Southeast Asia Summit 2017 last month, the largest social enterprise forum in Asia aimed at spurring the region’s social entrepreneurship economy. With more than 200 participants attending the forum on September 19-20, Kopernik is proud to have been a sponsor and knowledge partner for this gathering of social entrepreneurs, investors, corporations, government and funders from all over the world. During two different sessions, Kopernik engaged participants in a discussion on the role of multi-sector collaborations and lean experimentation models in the development sector. Tomo Hamakawa, Kopernik’s Chief Strategy Officer, led a session on ‘Unusual Suspects for Innovation’, during which the panel discussed the importance of a multi-sector collaboration in achieving the Sustainable Development Goals. The panel included Suzy Hutomo (The Body Shop Indonesia), Ashran Ghazi (MaGIC - Malaysian Global Innovation & Creativity Centre), Valerie Crab (UNICEF), and Chris Loxley (Unilever) - via video presentation. Kopernik Co-founder & COO Ewa Wojkowska (far left) leading a discussion on ‘R&D for Social Impact’. In another session, Kopernik Co-founder and Chief Operating Officer Ewa Wojkowska led a panel discussion on ‘R&D for Social Impact’, which explored ways that actors in the development sector can apply principles of research and experimentation within their work. Joining Ewa in the discussion were Derval Usher (Pulse Lab), Athman Ali (KOMPAK), Amri Ilmma (J-PAL Southeast Asia) and Richard Wecker (UNICEF). The sessions attracted people from various backgrounds including social entrepreneurs, private sector professionals, international donors and UN agency representatives. “It was a great discussion, I learned how different players contributed to the changes needed in the world. What was striking to me is that everyone can take part in this processes,” said Gove de Puy, a sustainability expert. Kopernik also invited forum participants to have a glimpse of the lean experimentation concept in practice with a virtual reality (VR) trip to Adonara, East Flores, where Kopernik team members are working with farmers to add value to their produce to increase farmer incomes, through a series of rapid, small-scale experiments. The VR trip was well-received by the audience, who thought that this was a great way to showcase the actual activities on the ground. 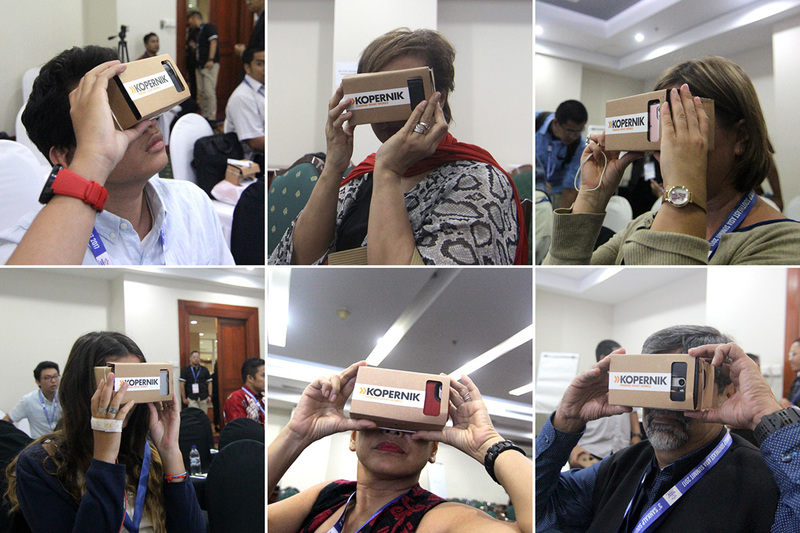 Sankalp Southeast Asia Summit participants taking a virtual reality trip to Adonara, East Flores. Following the Sankalp Southeast Asia Summit in Jakarta, Kopernik is excited to follow up on new partnership opportunities which emerged during the summit. “We believe that finding what works can only be achieved through collective effort. We seek partnerships with those who want to find practical and sustainable solutions to poverty reduction,” said Ewa.